Byzas was a Greek colonist from the Dorian city of Megara, son of a King , who consulted the oracle of Apollo at Delphi. The oracle instructed Byzas to settle opposite from the "Land of the Blind". Though he was confused about this strange instruction, Byzas searched for a land for his people and he completely forgot what oracle said. When he came to a place with a most fantastic view he had ever seen and also noticing the other side of the water populated by some strange people, he asked: "are they blind to live there where there is this place?" It was the moment he remembered Oracle and decided to settle there..
Ottomans inherited a wreckage as far as the old palace is concerned..It was runsacked in 1204 by christians (who were staging yet another crusade :P ) so ottomans did not destroy it specifically. 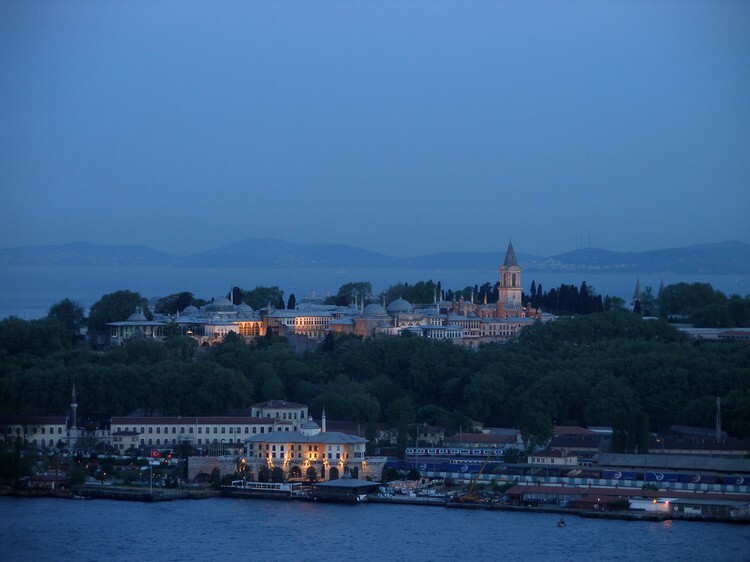 Topkapi palace was never a static palace: It grew with the empire. It was not built like other palaces in the west where they would have a design and that design would be constructed in one go..Topkapi grew organically..They needed more people for the palace and then they needed accomodation for those people and of course they had to built larger kitchens to feed them etc..(In the end 4000-5000 people were living there). Because of its growing nature, it also reflects the lives in time. During declining period of the empire, most of the sultans were enclosed in the palace and that is the reason the buildings during their periods show also their their insecurity. The figures on the walls, in the gardens, on mosaics can be interpreted as they did not have much outside contact so they brought the nature into the palace.. Since its richness and luxury have the secondory importance and or not existant, its importance comes from its character, its customs and its traditions. All sultans´ were left from Topkapi when they died for example..All of them had their cirumcision there (well you westerners can think of it as a minor surgery but it is a very important event for us :) ) ..One of the doors (babulselam -where tourists enter the palace)was representing the respect to the sultanate so that nobody apart from the sultan himself, was allowed to go in on a horse..
Divani Humayun (Ottomani state engine)-Ottomani concil met here to solve the problems of the empire. And all these activities were performed with very strict and detailed rules. Ottomans did not have aristocracy but instead, they grew their own ruling class in this palace. Most of Ottomani ruling elites were graduates of Enderun which could be called the most important institution until the 18 century in Ottoman ruling engine. It also has one of the biggest collection of china in the world with 12.000 pieces.. Lets talk abit about the most mysterious and egzotic place in the palace: Harem. Sultans would keep their harem in the old palace but because of his love to Hurrem, Kanuni was the first sultan brought his harem to this palace. The most important thing about harem is that it is a palace and a prison at the same time!! Nobody could come in and nobody could go out.. It was built to hide the women of sultan from men. It was guarded by enouches who were castrated. They were prisoners there too..
After a certain date, princes would live in a corner of harem as well but they were practically prisoners as well (the section they lived called ´kafes´ which means ´cage´).. Since we mentioned about sultanahmet mosque, a quick info about it: Normally sultans would built the mosques with the spoils of war, but Ahmet I was not an old style sultan and he did not built that mosque with the booty (because he was not a fighter sultan. He did not win any war at all :( ). Instead, he used the money from the national treasure..Because of that, they say , the people protested in the beginning by not coming to the mosque for praying (well they also say that the protest went on nearly 100 years).. It was first constructed by Fatih Sultan Mehmet, (the Conqueror) in 1478. The palace having around 700.000 m.² area during the foundation years has currently 80.000 m.² area. By the order of Mustafa Kemal Atatürk,.. opened to public visits on date of April 3, 1924,...and finally it was renamed as Topkapi Palace Museum Directorate and it still continues its services. But another sultan Osman III was completely opposite and he could not face any women..He got made special shoes with nails underneath and he would walk with those shoes so that when women heard the noise they would go into their rooms.. Same goes Mehmed IV as well..He was in love with a boy called Guloglu and he was made a pasha as well..
One of Enderun graduate was Kilic ali pasa who became kaptani derya (which was the highest ranked chief commander of the navy in the Ottoman Empire). According to rumors he had a very very ´bed´ habit. He would sleep with a virgin almost every night. When he was quite elderly, he fell quite ill.. The doctors told him that ´you have to take these medicines and then you have to diet´. But when he realised the diet was nothing to do with the ´fried veggies and lamb´, he kicked the doctors out by saying ´my medicine is not what you advice, my medicine is what you are trying to ban´. And he arranged a party around his bed at that night. A bit later, they took his corpse away from his bedroom! !